Managing a website or blog usually means having to juggle many things at the same time. Faced with tight deadlines and increasing competition, publishers have learned to appreciate any help offered by technology that allows them to perform their tasks more efficiently. Thus, the process involving tracking reports and analyzing your monetization results needs to be streamlined in order to determine as quickly as possible whether you have a winning horse or a turkey under your wing. Thankfully, RevenueHits is well aware of this, and it offers publishers a precise and uncluttered overview of the health of the monetization effort publishers are running. This is paired with a robust analytical engine offering to propel your placement performance to unprecedented heights. Running a blog or website demands investing a lot of time and money, so publishers want to see a profit from the ads they're allowing to display on their web assets. Making each ad count means that you’ll want to keep close tabs on their performance in form of detailed and informative reports in real-time. This is why RevenueHits ad network places performance and transparency at the heart of its business credo. In order to offer you quality monetization performance, RevenueHits starts by using your site as a platform that will show only high-performance ads that are served by means of Geo-targeted ad serving technology. The name of the game here is “context”. To optimize each ad placement, RevenueHits uses an advanced contextual algorithm for the selection of ads that will help you squeeze the most revenue from being shown to your faithful audience. In other words, these algorithms will act as an engine that works hard in order to determine the best performing ad for your specific needs and optimizes its performance based on gathered statistical data. This platform utilizes systems that involve tracking and reporting on multiple levels. As the majority of publishers know, having the right information at the opportune moment can be a powerful weapon. RevenueHits made this its key value proposition, by allowing its users to have direct access to all vital statistical data relating to the current placements they are running. These include impressions, eCPM, clicks as well as revenue per customer duration. In order to allow for great user experience, all of these vital pieces of information are color-coded for simplified yet laser-precise assessment. So, let’s say that you find it challenging to dedicate increasing amounts of time to handle the complexities of your ad placement, yet you want to stay on top of everything that happens with your monetization effort. RevenueHits offers to help you by providing ad service with the optimal rates, great ads of all types, as well as a quality support team available for help in any situation. By signing up with RevenueHits, you’ll have a detailed bird’s eye view of what is happening with your ad space, not unlike a general who wants to maintain constant situational awareness on the battlefield. In this case, your best ally will be an intuitively designed dashboard that is set up based on the principle of user-friendliness and attractive yet uncluttered graphic presentation. The heart of the dashboard is its “Report” tab that is a treasure trove of all information about the websites you work with, ad placements, Geos and other components of each digital placement. Yet, making sense of all of the numerous features of RevenueHits’ platform cannot happen overnight. Being aware of this, the company made the entire procedure smoother by providing you with trusty allies on this path. These are RH’s customer support team that is always on-hand whenever you need them. They play a key role in preparing newcomers for the onboarding process, as well as the initial setup of ads. Once you get the hang of all the inner workings of RevenueHits’ robust platform, you’ll soon learn to appreciate the dedication that the RH crew demonstrates when it comes to providing assistance in making your ads generate only the highest possible revenue. In addition to providing optimization and onboarding support, the support team will also supply you with ad codes and help you with resolving any technical issue you might encounter. Despite being fully aware that technical and other issues are an inevitable feature of every ad placement, RevenueHits focuses on preventing its clients from needing support as much as possible. This process starts by providing users with an intuitive preview for any action they take. For example, after the ad placement, you simply pick the desired ad type, such as the banner ad or the footer ad, followed by the ad size you deem most suitable for your needs. If you’ve selected a banner ad, for example, you will see a drop-down menu with different sizes to choose from. Also, you can see how the placement will look in the preview options. The goal of RevenueHits is to generate the highest income for its clients by monetizing their online assets. These include websites, apps, videos, widgets, special solutions, search and pop-unders. Pop-ups and pop-unders can boost revenue without compromising site performance at all. RevenueHits offers a large inventory of ads that promote performance-based offers, CPM and CPC ads. Its library of display and rich media ensures that the adequate size and ad format are at the user’s disposal for every application. In order to ensure this, users are given a preview feature that allows them to see how their ad will look on their website and determine if it needs modifying. Tracking ad performance allows you to see whether it will generate any revenue. This feature is enabled for all ads within your dedicated ad space, allowing you to make any changes to them you deem necessary. By giving you this transparent level of control, RevenueHits guarantees that not an inch of your ad space will be wasted on ads that do not perform well. Running a stellar ad campaign involves more than just worrying about ad placement through heat maps, or budgeting. All of its features need to be heavily supported by having clear insight into key ad performance metrics such as impressions, eCPM, clicks or revenue per customer. 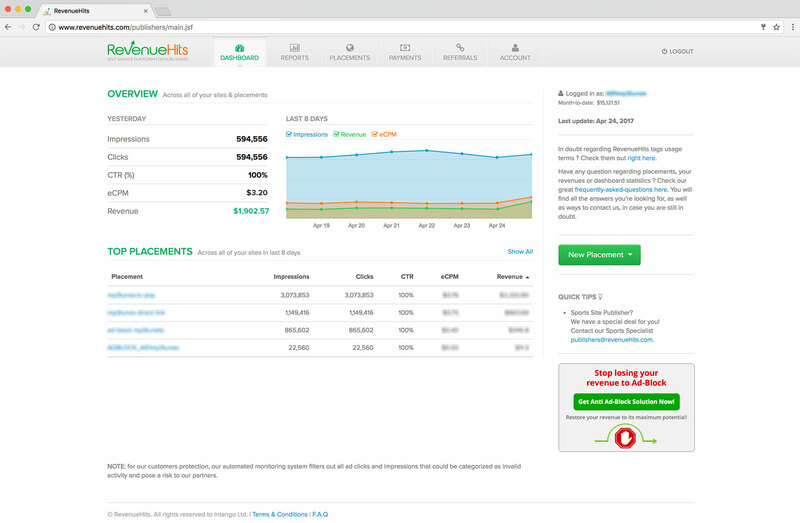 RevenueHits is fully aware of this and it wants to help its clients primarily by offering them contextual and high-performance ads that are managed via a user-friendly and intuitive dashboard. This platform gives them a clear insight into every relevant parameter related to ad performance, which, in turn, allows them to track placement performance and results in real time and set only the most suitable goals accordingly.